I can’t support this tweet enough. The holiday season can be tight for many reasons. Unexpected expenses pop up, you always seem to spend more than you mean to, and something in the house always seems to sputter out. The spirit of generosity is a beautiful thing, but generosity does not have to mean money. Being generous with your time, your words, your passion, there is no monetary value on that. 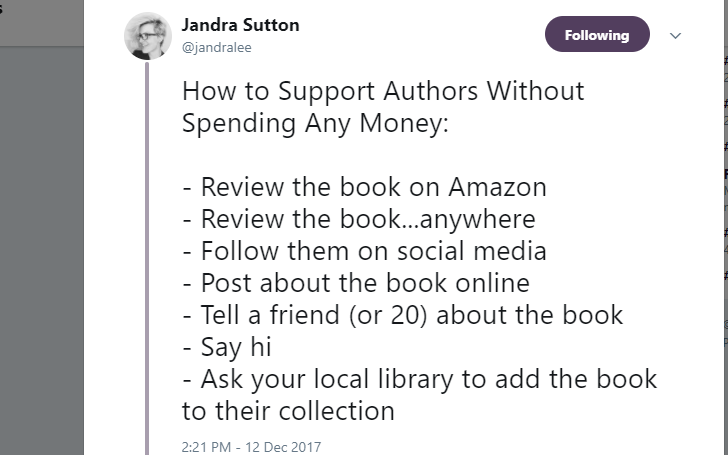 For authors who make their livelihood off their writing, support like this is pure gold, especially during the holiday season. In an ideal deal world, I would buy twenty copies of all my favorite books and just give them out as presents but Adulting. There are many methods, as this above post highlights, beyond monetary, that can help support your favorite writers, popular and indie alike. Review the book on Amazon: Amazon currently has the widest reach and greatest audience. There are also millions, MILLIONS, of books to be found. It can be a bit of a black hole without the buoyancy of reviews. The more reviews a book has the more likely it is to end up in recommendation algorithms. While a high number is ideal, twenty reviews can go a long way. Potential buyers read reviews. It doesn’t matter if the book is 5.99 or .99. 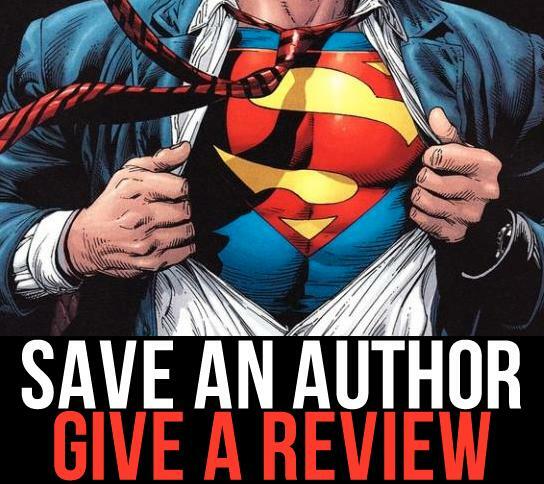 Reviews, honest reviews, help sell a book and if you love it, flaunt it. And you can flaunt it all over the place. 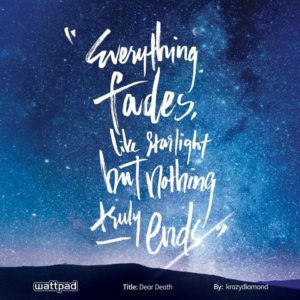 Goodreads, booklikes, Librarything, your own book blog, book love abounds. Following them on social media→ Most authors, indie and big wig, use some form of social media. Some use several, specially indie authors because it helps them connect to a wider audience. Being an author is now a social profession. This is especially true for the indie set, who must use every tool at their disposal to improve their exposure and sales. I would take it one step further, Follow and Interact. Like their posts, retweet them, share news of their upcoming releases. Your audience adds to their audience. Every person who likes, tweets, and shares off you adds to the chain. Think of it like the Thunderclap build, each follow adds their connected social network to the pot. Someone in your social network could be their next fan. Post about the book online. So you’ve reviewed the book, but you are dying to talk to someone about your favorite ship. This book contained one of your favorite world builds. Their words were like spun sugar on the page and make beautiful quote art babies. Talk about it. Open a conversation. Make fancy calligraphy. Fangirl the frack out of it. Passion carries. Enthusiasm attracts curiosity. Tell a friend. You know their tastes. You can tell they are gonna love this story if you put it in front of them. And then you can fangirl it together. Say Hi. So simple but authors like to interact. 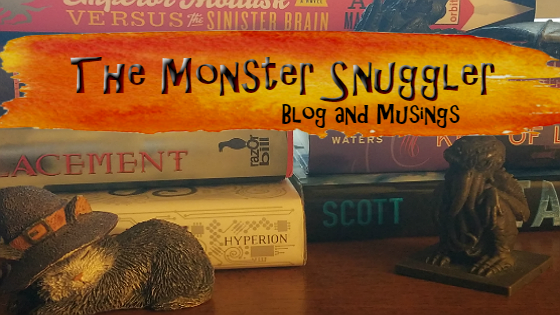 We aren’t some oddball ogres shut up in our writing lair…mostly. Look, authors across the spectrum love their readers. Everyone from King to Rowling, to the newbiest newb newb debuting their first self pubbed book, respond to fans. Now response times may vary, but in general, authors are pretty willing to answer questions, share anecdotes and stories, and interact like hoomans. And that interaction can be a big deal for a new author. And it doesn’t have to be a long fan letter. You can interact through tweets, comments on their social media, or for serial authors, their chapter posts. Just knowing someone is out there, enjoying your work, is like a shot of sunshine in their day. Ask your local library to add the book to their collection. Now I fully support this but I must add a footnote. Depending on the town, the library might have a strict budget or space constraints. Most are open to putting an indie book on their shelves (my local library put my book on the shelf) but they might not be able to pay for it. I donated my own book. I considered it a worthwhile investment. And if someone reached out to me and said ‘Hey, I would love to see your book in my local library but they don’t have the budget for it’, I would donate a copy to their library too. I think most indie authors would share the same mindset if a library can’t foot the bill and that brings us back to the previous point. Open a conversation! An indie author will probably be thrilled to send a copy of their book to your library.